So I've been on the Young Living Essential Oil train for almost 2 months and am loving it. I use my diffuser every night and the kids can't get enough. Just this past month, I ordered some of the new Kids' Oils too! 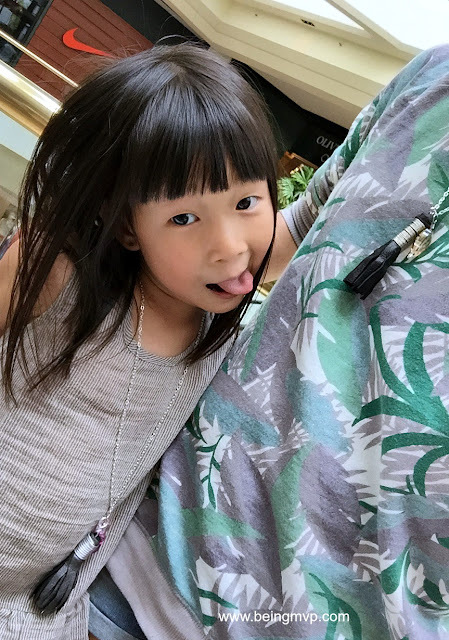 However, when I go to work or we go out during the weekends, I have no way of taking my oils with me so I thought why not make a diffuser necklace? I've seen so many different variations but went with the on trend tassels! 1. Cut a piece of leather to approximately 3" x 7" with the rotary cutter on the cutting mat. I love this self-healing cutting mat so much! 2. 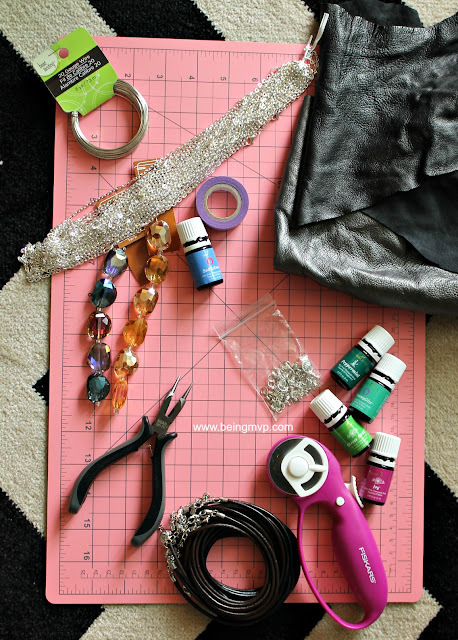 Take a piece of washi tape and place across the length of the leather piece about 1/2 inch from the top. 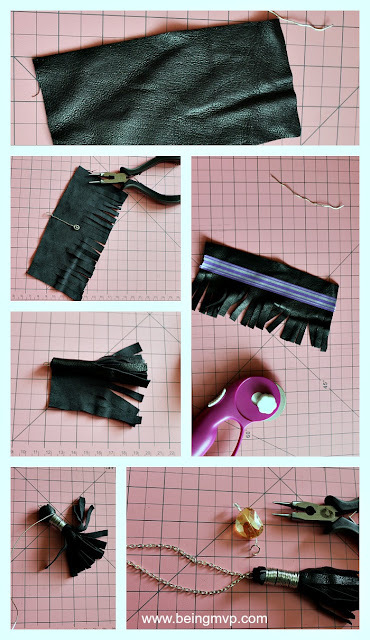 Make vertical cuts from the washi tape down to create tassels. 3. Cut a piece of 20 gauge wire about 5 inches in length and using the multi-purpose tool, make a loop on one end and then fun swiggle loop (or whatever else you like) on the other. I used the 12 gauge wire for Kenzie's necklace. 4. Roll the leather around the wire piece completely. Take the end of a new piece of wire and start wrapping from the top cut of the tassel to the top. Make sure to tuck ends of wire so it's safe. 5. Pick a stone or jewels that you like and thread through fishing line or wire and use crimp breads and jump rings on either side to secure. 6. 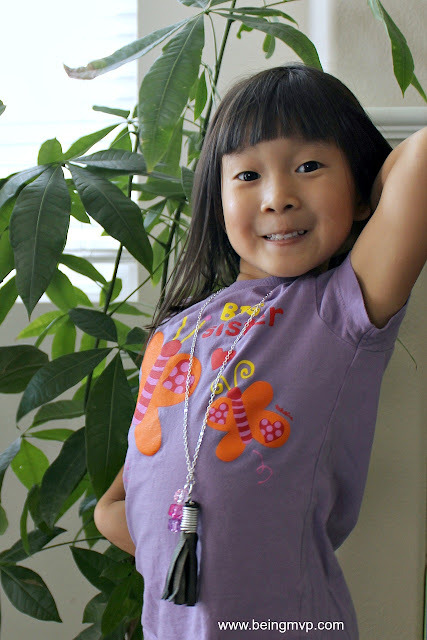 Open a jump ring and connect the tassel to the chain necklace. Do the same with the bead/stone. 7. 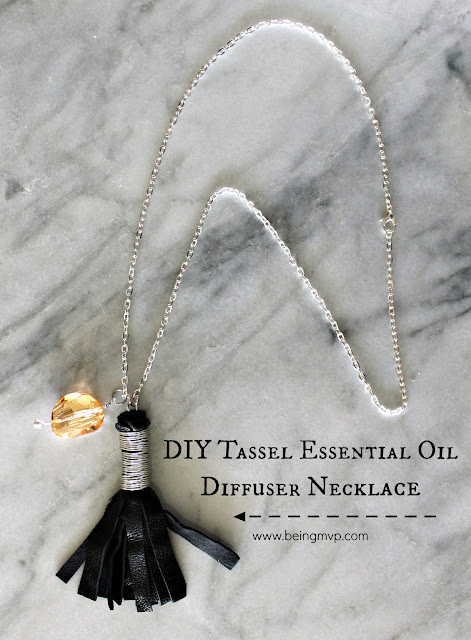 Grab your favorite essential oil and place a few drops onto the underside of the tassels. 8. Wear and enjoy! These are awesome and when the scent goes away, just add a few drops of another oil you are feeling ;) P.S. They make great teacher gifts as well! Contact me if you are interested in Young Living Essential Oils. 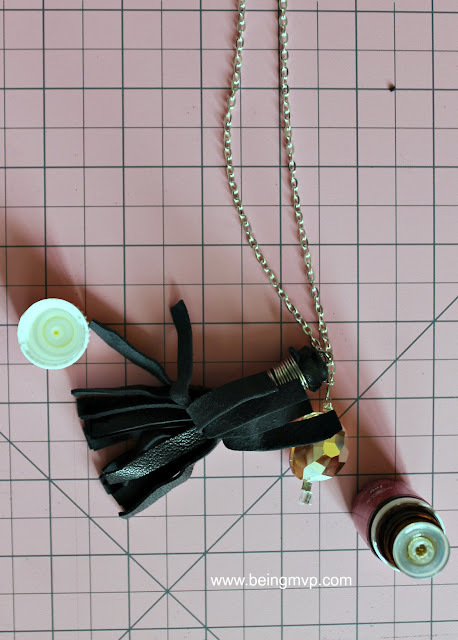 Whether you decide to buy a Premium Starter Kit or just make an order, I'll send you your own Tassel Essential Oil Diffuser Necklace + some other goodies! 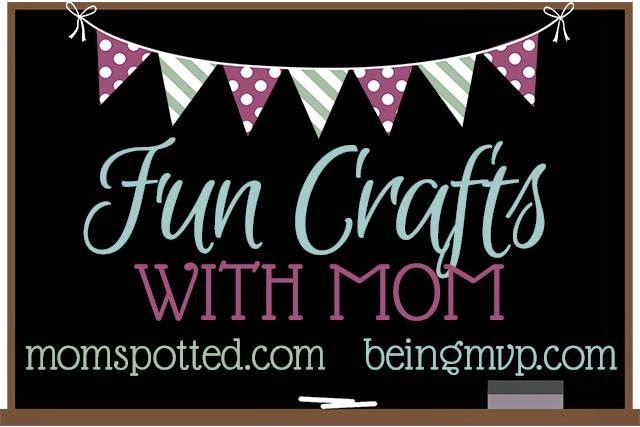 Check out the Rainy Day Umbrella Preschool Craft from MomSpotted this week. I hope you enjoy and link up your craft! Wow you did an amazing job! I love it!! This is such a classy diffuser. I've been seeing lots of different designs, but this one is unique and trendy. I love it! I love this idea! We use essential oils (mostly for aromatherapy) and this is such a unique way to use them on a daily basis. Plus it looks cool! Thanks for sharing! What a great DIY! I would love to make one of these for my sisters and my mom. So pretty! A teal and coral colored one would be great for summer wear. I completely like the idea of this and it would be wonderful to be able to use the essential oils without lugging a bunch of bottles around. Did I mention its a rather nice necklace as well? Omgosh do I love this!!! Its so super cute and so beneficial!! Thanks so much for the great idea!! !